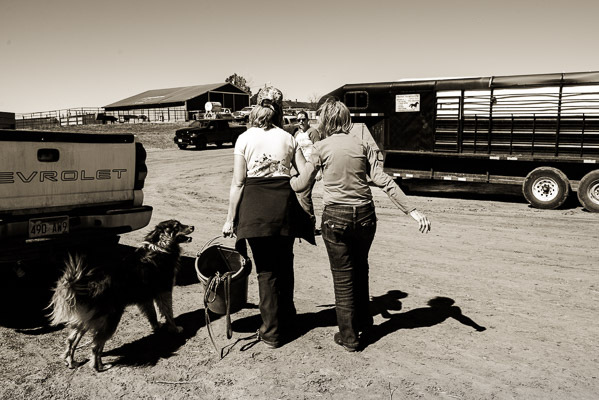 My third installment of the series on Kim Baum A day in the life of a daughter: Kim's life is an incredible balance between business owner, veterinarian, ranch hand, wife, mother, friend, and daughter. One of the most important roles she plays is that of primary care-giver to her 85 year old mother. Kim's mom, Patsy, is a feisty gal who still lives a mostly independent life in a separate house on the Silver Buckle Ranch. But Patsy has health problems and a touch of dementia and honestly, living single on a ranch is pretty lonesome. So Kim spends a lot of time with her mom. Patsy comes over for dinner each night, Kim brings Patsy along on her errands as often as she can, and includes her as much as Patsy is able. Kim takes care of Patsy's bills, medical appointments, and all her shopping. Older woman in a kitchen looking bord while women in background cook. Older woman looks on as her daughter cooks. Three women hovering by a stove, a short older woman in the back. People playing cards at a table while an old woman sleeps in the background. Two women sit on a benh on an ranch in the dirt. Old woman rubs her nose as another woman does her hair. Woman using a blowdryer on another woman's hair in a bathroom. 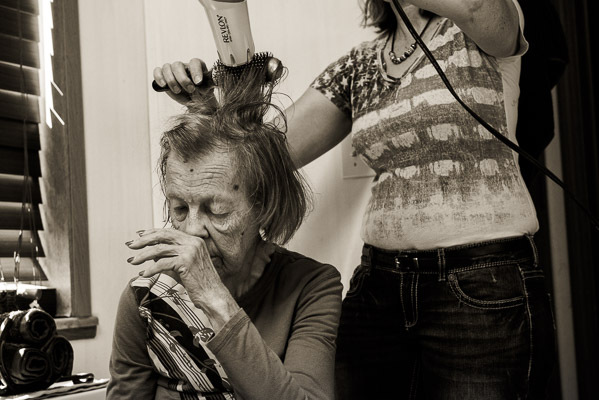 Woman spraying hair of her elderly mom. Women walking away from camera arm in arm on a farm. 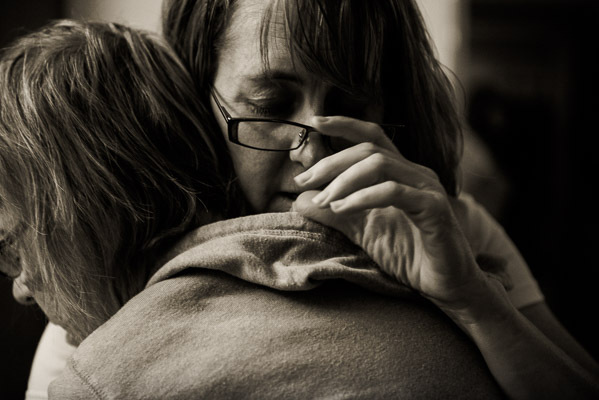 Women hugging, one touches the face of the other. 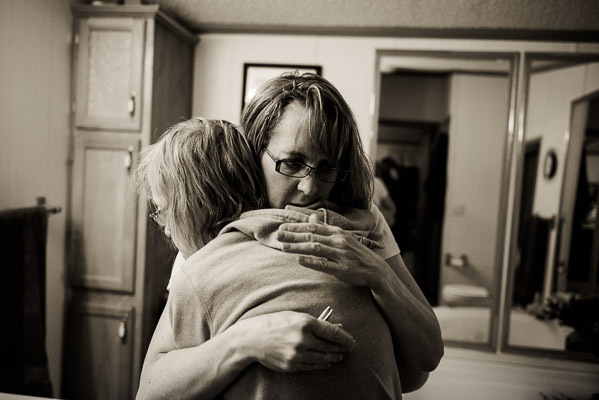 Emotional photo of woman hugging her mom. Day in the life photography captures your life as it really is right now. The photos are a record of the ordinary and extrordinary facts of who you are and all you contribute. Ready to schedule a session? Contact Me! Kim runs two businesses: DeAngelo Ground Maintenance in Arvada and she is also a Melaleuca advocate from her home in Elizabeth. 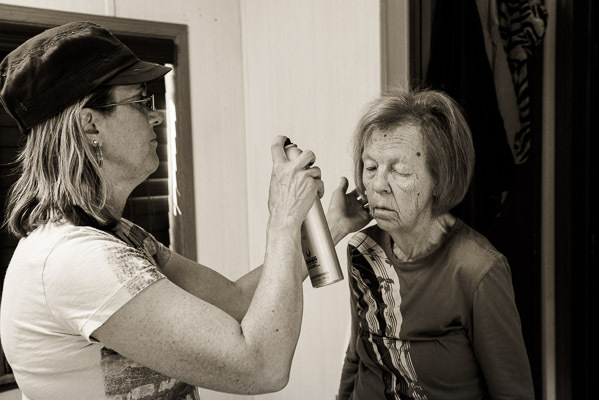 You can see from A Day in the Life on a Ranch, Kim's a busy woman who is managing a ranch, two businesses, taking care of her young teen son, and caring for her 85 your old mother full time. Kim attends meetings, goes to doctor's appointments, joins conference calls, manages the books for her husband's carpentry business, and takes care of her horses. She has a young protogee, Beth, who is learning roping from Kim, joins them for Sunday roping and dinner, and is also learning the Melaeuca business. Kim couldn't be a better mentor and friend. 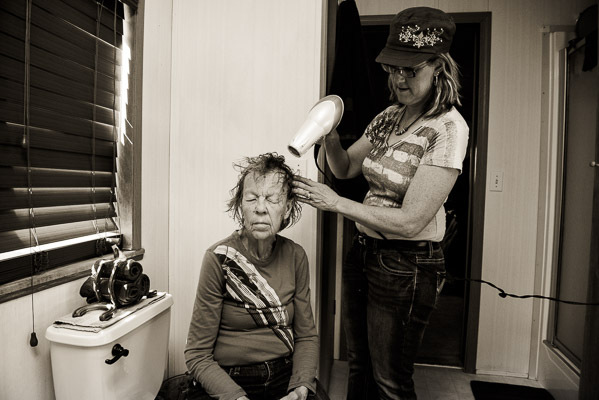 Willy is a documentary photographer in Denver, CO. Check out more Day in the Life Photography sessions.